In the mid 1960s Latin teenagers in New York's Spanish Harlem neighborhood created a new style of music called Latin boogaloo. The sound was a mix of the Cuban music they grew up with and American R&B like James Brown and Hank Ballard. It quickly caught on and before long the young purveyors of this new sound were taking business from the likes of Tito Puente, Tito Rodriguez, and Eddie Palmieri. Soon the established acts reluctantly joined the craze and recorded a smattering of Boogaloos. However, many of them were not happy about it. In general they felt it was beneath them. Eventually a small group of the most powerful people in the Latin music business conspired to kill off the Boogaloo and make way for the burgeoning Salsa craze. Concert promoters, DJs, and venues were bribed to turn away any and all Boogaloo business. As soon as it came, it left. 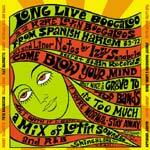 Secret Stash Records is proud to present this double LP compilation of rare and hard to find Boogaloos. Each track has been selected with the help of veteran Boogaloo producer Bobby Marin.